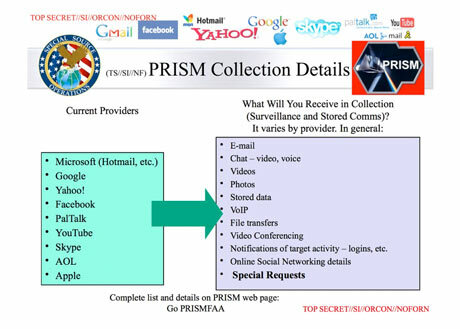 While PRISM is potentially the least troubling with respect to its legality and the type/volume of information of the 4 programs we’ve learned about, it is also the most technically puzzling. 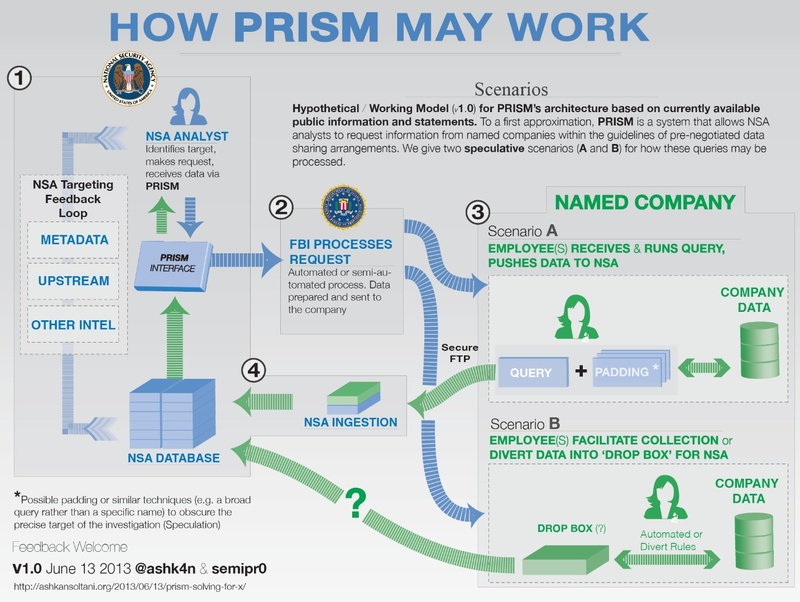 There have been many theories on the architecture of PRISM and I’ve been inundated with requests to help press/advocates understand it — so here goes. Direct access (“root”) to the named companies’ servers or infrastructure. 0. The government first establishes as relationship with the company, negotiating for access to their user’s data. Then a process is set up with each company which entails identifying individual points of contacts (with clearance? ), type of data available, and transfer procedures/protocols (i.e SFTP) for each instance (Figure 3 shows the timeline). 1. An NSA agent at his desk makes a request from the company. 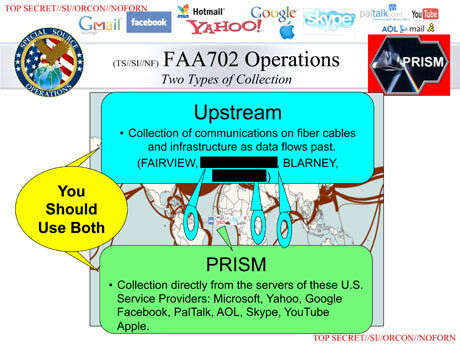 His request is potentially based on intel from one of the other programs, including metadata surveillance programs reported in addition to FAIRVIEW/BLARNEY in Figure 3. For example, metadata intel might reveal suspicious activity from an IP address of a presumed suspect to gmail. The analyst then makes a request from Google for emails originating from that address. 2. Each request is purportedly vetted by the FBI in order to ensure that it’s not overly inclusive of U.S. citizens’ information. 4. The company determines how to fulfill this request and provides the resultant data to the agency — this is where things get interesting. How effective is the the 51% test? Are company employes/contractors trusted with the potential target of an NSA investigation or is the data padded/obfuscated in some way? How are the queries monitored for accountability and data minimization? How are these systems kept secure and prevent things like what happened with Google’s Aurora? That’s my analysis. Thanks to semipr0 for the graphics wizardry and helping me think through this. Any feedback welcome — contact me here. 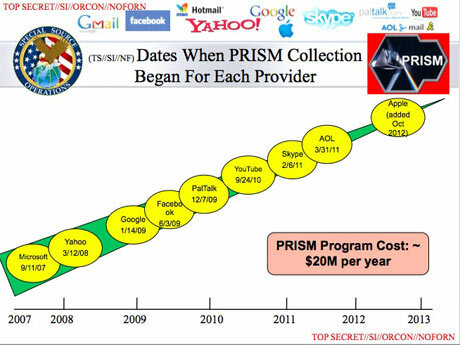 Someone translated our PRISM graphic in Iran (though sadly I can’t read/write Farsi).